Most insulation end users are aware that thermal insulation pays for itself through energy savings. Heat loss from uninsulated pipes and equipment will be far greater than from the same pipes and equipment with insulation, with the ratio depending on the service temperature, ambient conditions, and insulation type and thickness. In any case, insulation efficiencies of 95 percent or greater are fairly typical on hot (at least 600 F) surfaces. At today’s high energy prices (around $12 per million Btu), the simple payback for mechanical insulation on hot surfaces is so short that by the time the insulation job is complete and the facility back up and running, the insulation often has already paid for itself. Removable insulation blankets are often selected by facility owners and/or operators (hereafter referred to collectively as operators) for one simple reason: they save money over the long haul. 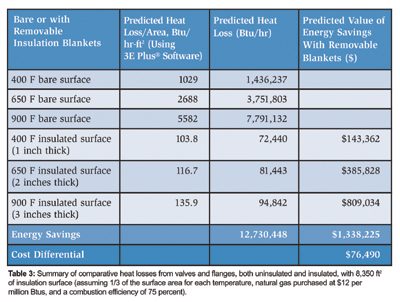 The savings are realized not because removable blankets perform better than conventional insulation. Rather, they offer savings over conventional applications because they require far fewer labor hours to remove and reinstall. For example, when removable blankets are installed on valves and flanges that require frequent access as part of plant maintenance, the operator saves labor costs every time they are removed and reinstalled. In fact, the more often they are removed and reinstalled, the more money is saved. Practically speaking, removable insulation blankets reduce heat loss and thereby save money otherwise spent for energy. This is the reality of operations and maintenance at an industrial facility. When plant maintenance personnel need access to a flanged valve or flange, they break or tear off some of the existing conventional insulation, do their maintenance work, and then (due to a tight schedule) might fail to reinsulate all the equipment when their work is complete. After the facility resumes operation, with some insulation missing on those flanges and valves, high heat loss results—and higher heat loss means more money spent for energy. The case described below is an actual expansion project at an oil refinery located along the United States coast on the Gulf of Mexico. A contractor who bid on the job provided the information. The work involved more than 1,000 valves and flanges of various sizes with various operating temperatures. The operator’s insulation specification required the use of ASTM C1086 glass fiber mat insulation in three thickness sizes corresponding to service temperature ranges of 1-inch thick for up to 500 F, 2 inches thick for 500 to 800 F, and 3 inches thick for 800 to 1,000 F. The outer fabric was specified as silicone-impregnated fiberglass cloth on both sides for up to 400 F. For higher temperatures, the specification required a stainless steel foil-woven glass fiber fabric laminate on the hot side. For the purposes of this discussion, “conventional insulation” means insulation that is installed in a permanent manner or is not expected to be removed, stored temporarily and reinstalled as it was originally. “Removable insulation blankets” refers to discrete, flexible insulation covers consisting of an insulation media covered with a fabric or fabric laminate, designed with a fastening system that allows an insulator to completely remove, store and then reinstall those blankets using only simple hand tools such as a pair of pliers and a wire cutter. 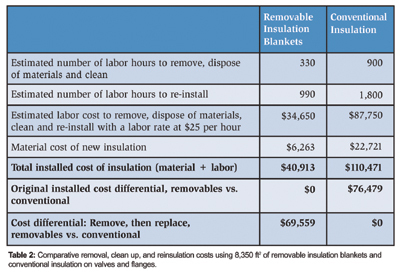 A comparison of first costs using removable insulation blankets versus conventional insulation (Table 1) shows the blankets to be more expensive, which is expected. Table 1 provides some comparative numbers to consider assuming a labor rate of $25 per hour. It was estimated to cost nearly $76,500 more to initially insulate with removable insulation blankets on the valves and flanges. That is about 84 percent more expensive than installing conventional insulation, a significantly higher cost to the operator. However, when it comes time to remove insulation for maintenance work and then reinsulating those valves and flanges, the removable insulation blankets begin to pay for themselves. The following comparative case study offers a look at the future labor cost savings when maintenance is required on the insulated fittings. As illustrated in Table 2, the insulation contractor estimated that removing conventional insulation and disposing of the insulation materials on the above valves and flanges, then performing clean-up, would require almost 900 labor hours. Reinsulating with conventional materials would require another 1,800 labor hours. The estimated total labor cost to remove, dispose, clean up and reinsulate came to approximately 2,700 labor hours. Of course, the plant operator would have to purchase new insulation materials for his valves and flanges at the original cost, and would have an additional 30-percent cost for support. Taking off the removable insulation covers, by contrast, was estimated to require only about 300 labor hours, with another 1,000 labor hours to reinstall, for a combined total of 1,500 hours. The number of hours is low because removable insulation blankets are reusable. It is important to add, however, that due to some damage that would inevitably result from handling, this estimate assumes that 5 percent of the removable blankets would require replacement during each maintenance cycle. As the above scenarios illustrate, initially the removable insulation blankets would cost the operator about $76,479 more to purchase and install than conventional insulation. 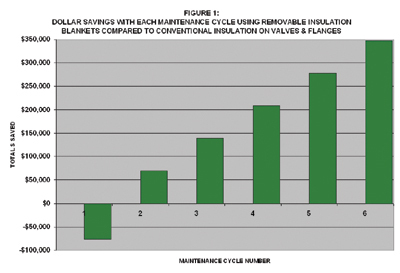 However, with the first maintenance cycle, the removable insulation blankets would save almost the same amount ($69,559) compared to using conventional insulation, mostly in craft-labor savings. In short, the removable insulation blankets would almost pay for themselves after the first full maintenance cycle. Based on these estimates, each successive maintenance cycle would reap additional savings of nearly $70,000 (as shown in Table 2). Figure 1 illustrates the initial investment difference and the longer term savings with each successive maintenance cycle. Note that after five maintenance cycles, the savings would be about $350,000 minus $76,500—or $273,500— a significant savings from an initial investment differential of only about $76,500. Is it cost effective to save $70,000 worth of labor costs each maintenance cycle on 8,350 square feet of insulation (representing a little more than 1,000 valves and flanges)? The answer depends on how often the facility performs maintenance. If it only receives maintenance every 10 years, then that would be a 10-year simple payback, which is not impressive. However, if the maintenance cycle is once every year, then the removable insulation blankets would come close to paying for themselves in only one year. It may be worthwhile to restate that this case study involves an oil refinery that often requires online maintenance, meaning that the insulation work has to be done on a hot system. In those cases, the use of removable insulation blankets becomes both faster and safer, as the hot surfaces pose a burn hazard to the insulators. It is also worth emphasizing that this type of analysis is project specific. The payback analysis depends not only on the frequency of maintenance but also on the local cost of labor. The lower the labor rate, the longer the simple payback period would be. The higher the labor rate, the shorter the simple payback period. For this case study, the estimate was based on a relatively low labor rate, including contractor mark-up of $25 per person, per hour, a realistic value for the Gulf Coast but conservatively low for much of the rest of the United States. No Insulation. The same insulation contractor who provided much of the above information had an interesting experience at another oil refinery, also located along the Gulf Coast. In 1999, he was contracted to furnish and install removable insulation blankets there for a number of valves and flanges. Upon arriving to the refinery with the blankets, the contractor was instructed by the operator to put all the blankets in the warehouse instead of installing them. The reason was that the operator had become concerned about maintaining design heat loss; he had not originally planned on using conventional or any other type of insulation on those valves and flanges. The original specifications left them all bare and uninsulated. In 1999, remember, crude oil was selling for about $10 to $15 per barrel, and natural gas was selling wholesale for under $2 per million Btus. Today, of course, those prices are around $60 per barrel for oil and $12 per million Btus for natural gas—about 400 percent higher for crude oil and about 500 percent higher for natural gas. It is interesting to consider what it would mean in terms of heat loss, value of wasted energy and simple payback for the removable insulation blankets if the refinery described in the scenario above installed the insulation blankets instead of placing them in a warehouse. 1/3 of the valves and flanges being considered operate at 400 F, 1/3 at 650 F, and 1/3 at 900 F.
Removable insulation blankets are 1 inch, 2 inches and 3 inches thick on each of the above, respectively. For heat loss calculations, the average ambient temperature is 67.9 F and the average wind velocity is 4 mph along the Gulf Coast. The owner/operator purchases natural gas from his distributor for $12 per million Btus. A bare valve or flange has twice the surface area of one that is insulated due to the convoluted shape of those fittings (see ASTM C1094, “Standard Guide for Removable Insulation Covers”). The computer software 3E Plus® Version 4.0 (available for a free download from the North American Insulation Manufacturers Association at www.pipeinsulation.org) was used to estimate the heat loss for each of the above temperatures, both uninsulated and insulated with the specified thickness. The results are summarized in Table 3. Table 1 showed that it would cost about $167,000 to purchase and install these removable insulation blankets on valves and flanges at this refinery. Table 3 showed the estimate of the value of annual energy savings: about $1,338,000. Dividing the latter by the former, indicates that the simple payback period would be only 0.125 years, or about 1.5 months, (45 days) at today’s energy prices. That is equivalent to a return on investment (ROI) of about 700 percent—impressive compared to today’s interest rate of around 4 percent. When valves, flanges and other equipment require frequent maintenance, easy access is highly beneficial. To keep the facility operator’s maintenance costs under control, it is beneficial to use removable insulation blankets in place of conventional insulation on those fittings and equipment requiring frequent removal of the insulation followed by reinsulation. In the case evaluated above (a Gulf Coast oil refinery expansion project consisting of about 1,000 valves and flanges, with $25 per hour labor cost), the removable insulation blankets were shown to almost pay for themselves in labor savings in one removal/reinsulation cycle. Every additional removal/reinsulation cycle results in additional labor savings. In some cases, industrial facility operators choose not to use any insulation on valves, flanges and other frequently maintained equipment. While the operators may have seemingly good reasons to do so, the quantity of additional energy loss and the value of that energy at today’s energy costs is extreme. The example refinery demonstrates a cost payback of about 1.5 months when insulating previously bare valves and flanges with removable insulation blankets. This represents approximately a 700-percent ROI. The greater the cost of energy, the greater the cost penalty for operators who leave valves and flanges uninsulated following maintenance activities. To ensure that the valves and flanges get reinsulated, operators should spend money wisely initially and specify removable insulation blankets for those valves and flanges and other frequently maintained equipment. In fact, they should specify them on any equipment that requires frequent maintenance. The investment, as seen, will quickly contribute to the company’s bottom line.